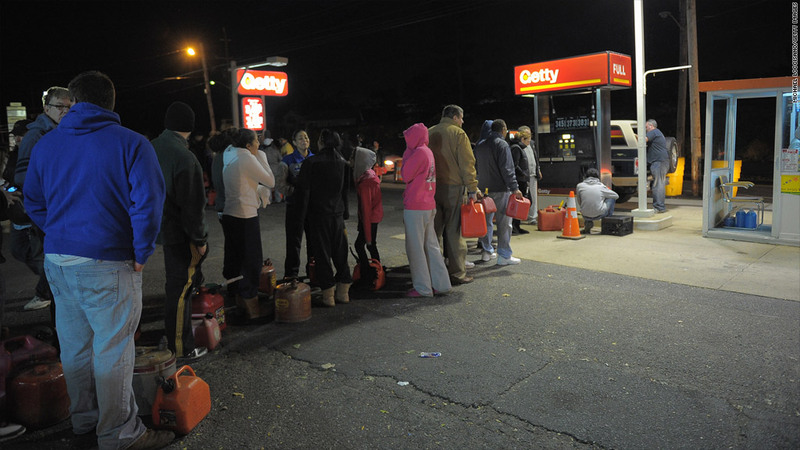 New Jersey residents waited in line at a Getty gas station in Sayreville on Oct. 31 to try and keep their generators running - their only source of power in the wake of Superstorm Sandy. Motorists in New York and New Jersey are lining up for gas in queues that are miles long in the wake of Superstorm Sandy. Gasoline supplies have been disrupted by everything from traffic jams to shuttered ports and power outages caused by the storm that carved a deadly swath through the region on Monday. "Gas lines are stretching for a couple of miles," said Anthony Ammiano, mayor of Freehold, N.J., who recalled the oil crisis of the 1970s. "It's like the Jimmy Carter years. It's a flashback of bad memories." Most major gas station chains, from ExxonMobil (XOM) to Hess (HES), are experiencing disruptions. There are also pedestrians toting gas cans waiting for their turn at the pump so they can power their home generators. "It's real bad," said Patricia Fitzpatrick of Manalapan, N.J., as she stood with gas cans in an hour-long line at a Wawa station in Jackson, N.J. "I've got a 100-year-old mother at home. I've got a grandson who's four months old. I have to keep them warm." Troy Terris, who was also waiting in line with cans in hand, said the gas shortage was driving some people to crime. "My sister in Manalapan had a can of gas sitting out front [for her generator] and it got stolen overnight," he said. 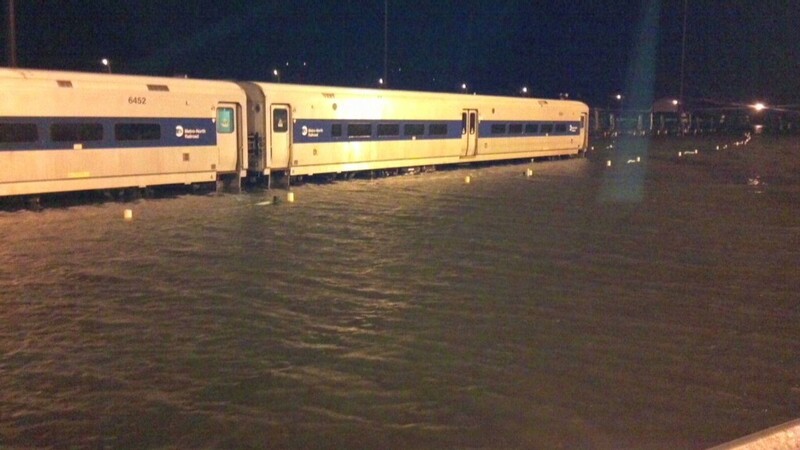 Robert Sinclair, Jr., New York spokesman for the motorist group AAA, said that ports in New Jersey and Staten Island, N.Y., are closed for fuel transport, and that shuttered public transportation has caused traffic jams making it difficult for trucks to transport gasoline to gas stations. Perhaps the biggest problem of all is the loss of power to areas of New York City, New Jersey and Long Island, N.Y.
"If there's no power, gas pumps don't work," said Sinclair. The lack of power has also shut down the Colonial pipeline, which supplies gas from the Gulf Coast to the Northeast, and is slated to resume production on Friday. Matt Smith, analyst for Summit Energy Services, said that refineries in the Northeast were closed by the storm but largely undamaged, so they could be up and running again in a few days. But with so much damage to the region's infrastructure, getting the gas to where it's needed will continue to be an issue for a while. "We could very well see shortages through the weekend and into the next," Smith said. Despite the shortage, gas prices have actually declined in recent days, both nationwide and in the storm-affected areas, according to AAA. This is primarily due to a seasonal slump in demand, following the summer driving season. AAA said in its monthly gas price report that it expects that gas prices across the country will continue to drop through the end of the year, assuming production resumes smoothly following Hurricane Sandy.